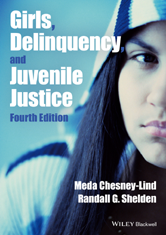 Editor/Author Chesney-Lind, Meda and Shelden, Randall G.
The new edition of Girls, Delinquency, and Juvenile Justice combines cutting-edge research and expanded coverage of girls violence to include data showing that, despite media hype, girls are not becoming more violent. It also covers girls in gangs and the emerging literature on the sexual trafficking of girls, adding some complexity to the sometimes over-hyped discussion of this issue. The overall approach is global in context. 1 Introduction: Why a Book on Girls and Juvenile Justice? Sociological Theories of (Male) Delinquency: Do They Apply to Girls? Instead of Incarceration: What Could Be Done to Meet the Needs of Girls? Are Gender-Specifi c Programs Necessary?